We hope you enjoy your visit here as much as we enjoy bringing it to you. 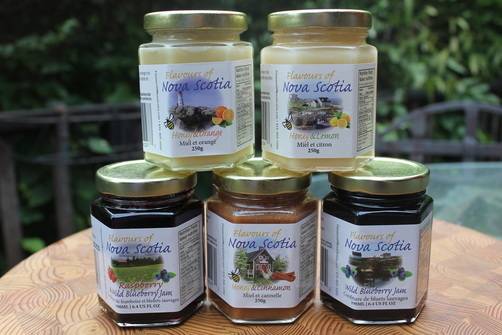 Our Flavours Of Nova Scotia Honey Spreads, Jams and Tea are very well received and make lovely gifts - even for yourself! Shopping in person is still the very best way to get up close and personal and we surely welcome that as you can find us at many shows or through participating resellers. Alternatively, we ship expedited and insured across North America and abroad from your online purchases. and we will keep you informed about our special offerings, latest recipes, most current shows and chances to win great prizes and more! Our loose leaf teas are very popular - Our Wild Blue is made with handpicked Nova Scotia wild blueberries, black tea, cornflower petals, blackberry leaves and natural flavouring. We love it hot or over ice. Available in 100 gram quantities (gross weight). It makes a lovely gift too! Who knew that tea could not only taste great but be good for you? We sample our tea at most of our shows. Be sure and ask to try it! Our Maple -Honey is made with real Maple Syrup. Try it in your coffee or tea, on toast (We're sure you will find lots of great uses). 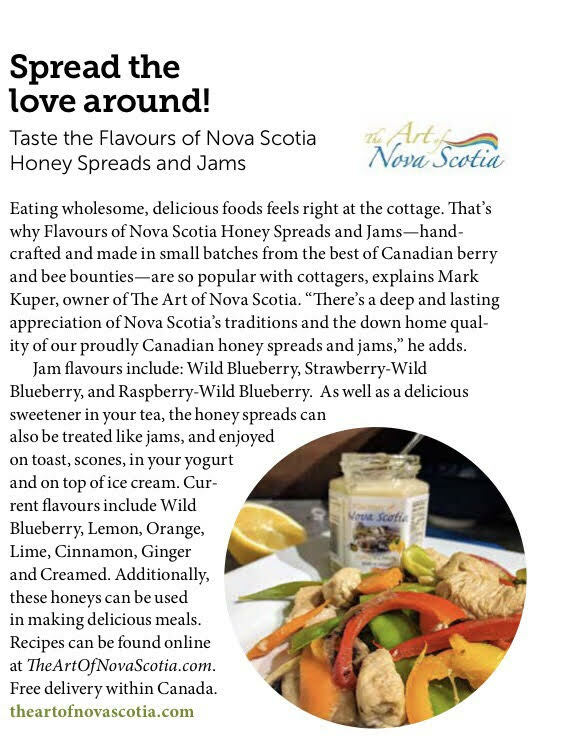 Our Flavours of Nova Scotia Honey Spreads and Jams are a proud family tradition. Made in small quantities; It's fresh and always made with the very best ingredients available. You can mix and match (please tell us the flavours you wish to order (and quantity of each) after adding the item to your cart in "add note to seller"
Please provide us a list of the flavours you want (and quantity of each) after adding item to your shopping cart in "add note to seller" If you missed adding it, don't worry; we will write you to ask you which flavours and quantity of each you would like. Order in bulk of 12 and save when you order an assorted 12 pack of our delicious Flavours of Nova Scotia Honey Spreads &/or Jams. Just tell us the flavours and quantity of your choices. If you don't see where to add them; don't worry - we will write you to make sure we get your selection right. Just place your mouse along the words on the navigation bar. You can then navigate through the pull-down menu and just click on the topics of interest. Orders exceeding $30.00 Canadian (pre-tax) , are shipped free of charge anywhere within Canada (one location per order). For orders outside this area, please write and tell us what you are looking to purchase and the address you would like it sent to and we will be happy to provide you with a quote for delivery costs (alternatively) if you make the purchase prior to getting a quote; we will invoice you for the additional cost to ship it to your out of country destination. ​​​"​Received my order....love,love,love... thank you"
Thanks for dropping in. If you just arrived, feel free to scroll up to the top of the page and mouse-over the headings to navigate our site. If you are leaving, we hope to see you again soon.